Feeding the 5000: "Feeding Bellies Not Bins!" 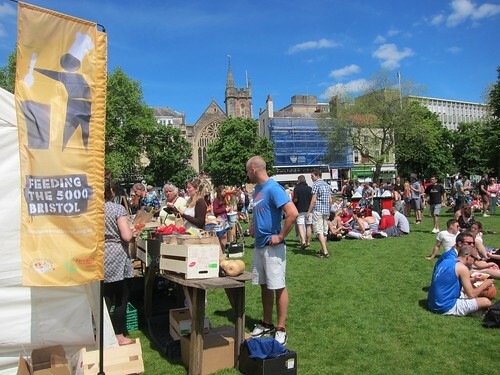 Feeding the 5000 is an annual event held in the centre of Bristol to highlight the massive problem of food waste. 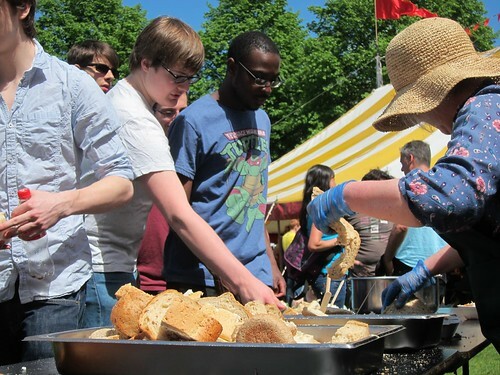 It is organised by FareShare South West who take food which would be thrown away from the food industry, supermarkets, vegetable growers and factories and redistribute it around Bristol to over 100 groups of vulnerable people such as homeless hostels, drug rehabilitation centres, lunch clubs and refugee centres. This work goes on tirelessly all year round, staffed largely by volunteers. The food which is donated is always within the use-by date but has often been packaged with an error on the box-which means that it would usually, shockingly, just be thrown away. This includes vegetables which are too big or too wonky, frozen food, tins, dry goods and drinks. On a visit to the FareShare warehouse, I was astounded by the quality and quantity of the food-it is admirable that this has been donated by the food industry but is just the tip of the iceberg-the majority of supermarkets and producers do not donate-they just dispose of food which so many people desperately need. 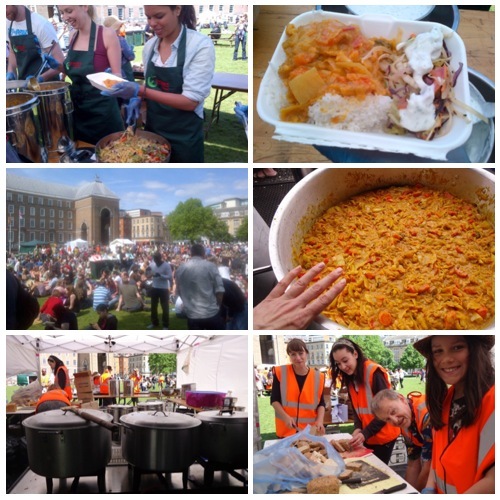 The Feeding the 5000 day serves 5000 portions of free vegetarian curry to anyone who comes to the festival - all of the food is made from donations and ingredients which would otherwise have been thrown away. This year we have been excited to be involved in the project after I met the project director, Jacqui Reeves and she told me about the logistics of chopping 600 kilos of vegetables with a team of volunteers. The Vegetarian Cookery School specialise in teaching knife skills and food waste is a cause close to our hearts so we stepped in to provide the knives, chopping boards and also some expert help with chopping! The amazing Thali Café provided the recipes and cooking facilities on the day and the curry was cooked by Pieminister using organic veg from Abel and Cole and spices from The Bristol Sweet Mart. We couldn’t turn down the opportunity to work with such fantastic Bristol businesses-real food local food heroes. Before the chopping began I had no idea of what 600 kilos of vegetables would look like-here is the answer! This was just the first batch of 450 kilos which we chopped in a 6 hour mammoth chopping session! My main worry before the day was the scenario of no-one turning up to volunteer-I needn’t have worried-an amazing team of about 30 helpers came and all got stuck in washing, peeling, chopping and sorting. It was a pleasure meeting so many people all with different reasons for volunteering but all supporting the cause and happy to help. The volunteers were led by the inspiring team behind FareShare including Jacqui, Matt, Claire and Super-chef Danny. The wide selection of vegetables was produce that would not have made the grade for organic veg boxes-it was either too small or, more commonly, too big for their selection. These beauties may give you an idea of the kind of size we were chopping! The build-up to the big day continued with two more days of veg prep-making raitas and salad fresh on the day before the event and a whole day prepping potatoes! The chopped vegetables were all taken to the industrial kitchens of Pieminister who kindly offered to cook the curry on a huge scale and were able to ensure that the food was pasteurised and heat sealed and the chilled so that it was safe to serve on the day. The day of the Feeding the 5000 came and what a day! Blue skies, warm sun and a crown already building before the 1pm kick-off. I was in charge of heating the curries with the help of the Thali Café team and Mark Lee, a volunteer who also happened to be a restaurateur. We soon established ways of heating the vast quantities of curry in the most enormous pans imaginable-stirring them with enormous paddles. A chain of servers was set up to plate up the curry with rice, crispy Indian style coleslaw and a yoghurt raita. The curry itself was delicious (as is would be using a Thali Café recipe!) it was a Southern Indian style coconut curry with mustard seeds, green chillies and curry leaves and, of course, a wide variety of vegetables! By one o’clock the queue had formed around the entire area of College Green when the event was launched by Tristram Stuart, founder of the Feeding the 5000 charity. We immediately started serving and got into the flow of plating up one curry every 4 seconds! This carries on until 6pm-with barely a break in the queue and lots of happy people complimenting the curry. 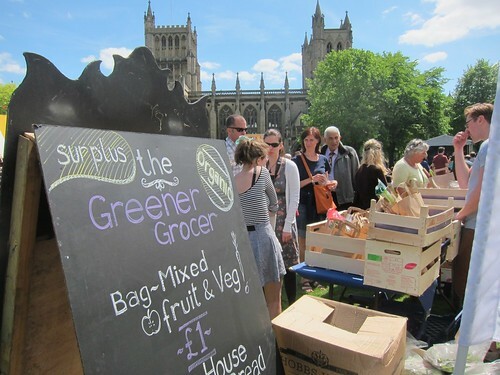 The day was a buzzing mix of live music, information stalls and a grocers stocked entirely from vegetables which would have been thrown away and speakers such as single mum blogger Jack Monroe who feeds herself and her son on just £10 a week. There was also a chef demo tent with live cooking from local food celebrities and chefs including our friends Barney Haughton and his brother Phil Haughton of the Better Food Company, Richard Bertinet and Emma Grazette. By the end of the day we had served a grand total of 4,324 curries-the other 676 potions were delivered to local hostels and shelters. The day had been a resounding success, raising awareness of the issue of food waste and giving people a chance to do something about it. For us at the Cookery School the best way of preventing food waste in the home is cooking from scratch and knowing what to do with your vegetables so as to get the most from them including making homemade stocks and simple nutritious and cheap meals using leftovers. 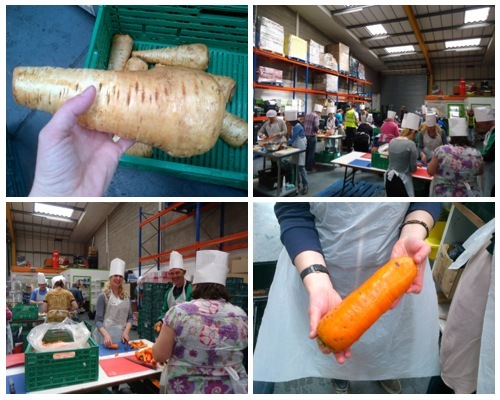 On a wider scale we all need to get involved somehow - either by signing a pledge to make change or by volunteering to help projects such as FareShare get the food that would be wasted to the people who need it most. We have already volunteered for next year’s event-we hope to see you there! 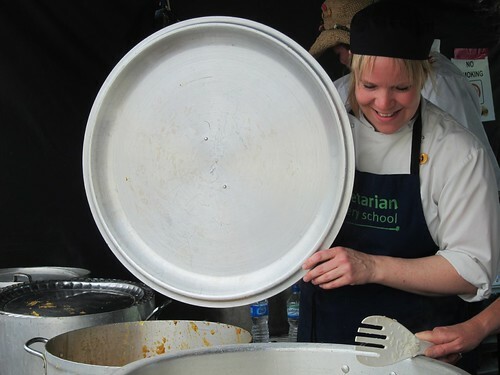 Thanks to Jo and the Vegetarian Cookery School for the amazing support you gave….We could not have done it without you.